In the continued Olympic Spirit of international sharing and cooperation, I bring you two yummy, inexpensive salads perfect for hot summer days and that utilize seasonal produce. This version of a French classic is pulled from my local newspaper’s weekend Food and Wine section, which is a great way to plump up your recipe collection. (If you don’t want to order the daily paper, you can subscribe to only the Sunday paper, or request somebody’s discarded Food section; most people don’t read the majority of their enormous Sunday papers anyhow.) It’s easy, inexpensive and quick if you’ve hard-boiled the eggs ahead of time, and takes very little cooking, so it won’t heat up the kitchen on a hot summer day. For the dressing, throw together the vinegar and Dijon and a bit of salt. Mix thoroughly and then whisk the olive oil into the vinegar in a slow, steady stream while you’re whisking, so that sucker emulsifies. Add a pinch of pepper. Steam your green beans for a few minutes until they’re just the other side of raw, also known as what fancy chef-people like to call ‘tender crisp.’ Then throw the beans in some cool water, so they’re salad-ready. Toss together your cherry tomatoes, olives, beans, and radishes with about ½ the dressing. Flake in the tuna, but don’t pulverize it. Cut two slices of bread per person and toast it—it soaks up the dressing better this way. Arrange bread on a plate and top it with the lettuce and then the tuna mixture. Chop the eggs into a few pieces and add a little bit more dressing. I put the extra dressing on the table, too, because oil, vinegar and Dijon are a divine mélange. And voila, you are done. If you prefer a salad with more Mediterranean flair and less je ne sais quoi, this is a great side salad for burgers, falafel, or pizza. In my kitchen, we’ve utilized the generous harvest of my friend’s cucumbers and tomatoes. Toss all your veggies together, mix in the vinegar and toss around again. Sprinkle in your oregano and give it one more stir with the spoon. 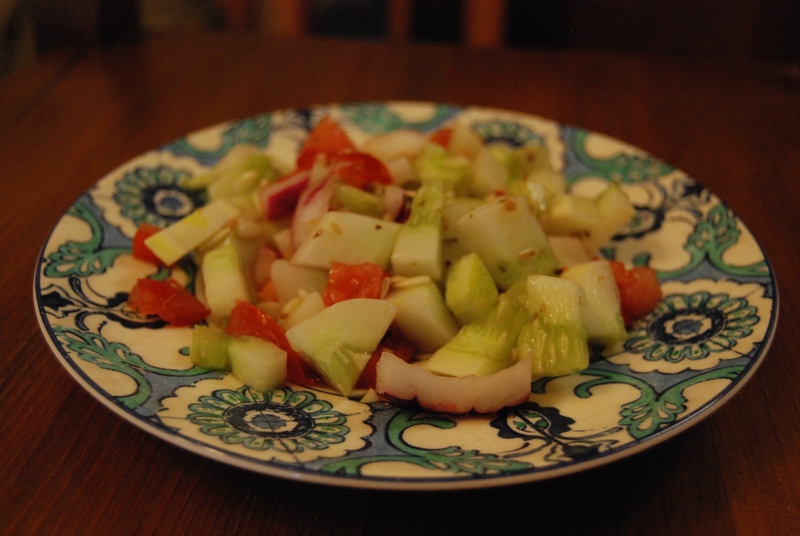 This salad is best cold (who wants to eat a warm cucumber… after all, the phrase is ‘cool as…’) so let its flavors meld in the fridge for an hour or so. And, it’s even better the next day. Enjoy your last days of summer and all your back-to-schooling if you’re living in the Northern Hemisphere. If you’re down under, best wishes for a happy spring!